If you had just ten words with which to describe why people should buy your company's products or service, what would you say? You probably remember the “elevator speech” concept from back when venture capital companies were pouring billions of dollars into Internet start-ups. And hopefully you heard about our own “Back of a Napkin” contest, in which we offered over $100,000 in services to the best new business idea. Whether spoken in an elevator or written on the back of a napkin, one of the key indicators of a strong value proposition is that it lends itself to being articulated simply, clearly and very briefly. But what is a value proposition? How can you “find one” for your business? And can an existing company find a new value proposition? These are some of the questions we have set out to answer. Our primary academic question was this: What percentage of the Internet marketplace has a truly effective value proposition? It seems that many people try to “out-market” a poor value proposition. They use the heavy force of marketing to try to overcome the weak force of their value proposition. How does this affect competitive marketing on the Internet? 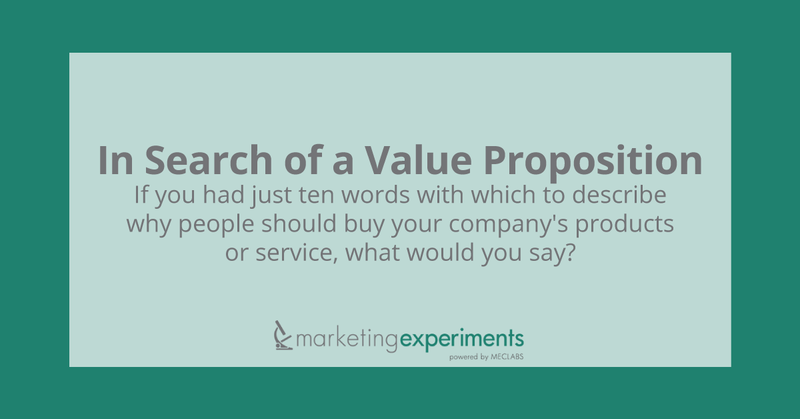 Our primary practical question was this: How do you evaluate your own value proposition? This brief starts to answer these questions and helps you apply the findings to your own business. In previous reports, we have stressed the importance of a Unique Value Proposition (UVP), which is one of the most essential elements of a successful online business. A UVP is a succinct statement of the uniqueness of a business that sets it apart from all competitors. Without a UVP, a company risks becoming lost in a sea of similar businesses. The UVP statement will often contain quantitative statements about the uniqueness of a business. Precisely WHY should customers do business with you? Online Competitive Analysis — How analyzing your competitors can identify your strengths and weaknesses and strengthen your bottom line. As marketers, we have complete control over “P” and some control over “C.” We typically have no control over “V,” at least once the business has reached the level of being marketed. However, “V” is always the most important. This is reflected in the above equation by giving it twice the weight of both “C” and “P” individually. Google is the search engine of the world. Microsoft is the operating system of the world. Wal-mart is the leader in low prices and huge selection. We receive hundreds of applications each month from companies seeking assistance with market research and business development. Many of them are successful and growing. Most of them have smart management teams. But very few of them have truly compelling value propositions that can be conveyed in a concise manner. Profit from Inbound Customer Service. We finally decided to issue a call around the world. In February of 2006, we announced a contest with a $100,000 prize. The rules were simple: send us a business plan but articulate the value proposition on a 5 x 7 index card (the size of a cocktail napkin). Within 24 hours, the plans began pouring in. We received almost 400 entries in 4 weeks. Many were from some of the top business schools in the U.S. Even more were from existing, profitable businesses looking to grow. Most lacked a really compelling value proposition. For many, due either to oversight or to inexperience, there was no value proposition at all. Only a handful of companies could articulate the value of their offers. The following table illustrates the breakdown of value propositions according to the 1-5 scale presented above. Applications with no value proposition are not included in the table. What You Need To UNDERSTAND: Out of 275 plans with value propositions of some kind, there were only 6 (2.18%) that scored a “4.” No companies scored a “5.” The great majority (86.18%) of companies scored a “2” or below. KEY POINT: Companies around the world devote extraordinary time and resources to developing and fine-tuning the product delivery chain (sales, marketing, distribution, customer service, etc. ), but FAIL to assess the most fundamental of business success factors: their value proposition. Most do not. According to the Small Business Association, as of 2004, more than 50% of small businesses fail within the first year; 95% fail within 5 years (*1). Many fail due to lack of experience or business sophistication. However, even companies with experienced management teams often fail due to causes stemming from a poor (or poorly utilized) value propositions. A smart value proposition can make a mediocre management team look very smart. (And vice versa, of course.) But only the best ideas succeed and grow to become billion dollar companies in the long run. Basics Body Care is a 100% natural body care products company. We sell handmade soap, lip balm, hand balm, belly balm (for pregnant moms), and spa gift baskets. We personalize our soap labels for baby and bridal showers. User-friendly website that customers use to select options for customization of magazine. Back-end content management system that allows magazine publishers to add editorial content, control advertising database, filter user profiles, etc. I want to supply boat owners with high quality boat names, registration numbers, and graphics by using our website. My site is unique in the fact that it allows the end user to have a hand in the design process and by allowing the customer to preview the image before submitting the order. EVERY boat owner is a potential customer of ours due to the fact that EVERY boat MUST display its registration numbers on the bow of the boat. Problem 2: The second sentence begins with: “My site is unique….” He’s talking about his business rather than a market need in search of a solution. Recycling of plastics and paper. Then, producing environmental friendly products. But how do you develop an effective value proposition for your own company? For a CEO, being able to explain a value proposition to customers, employees, and shareholders is the most important part of his or her job. Many times, a company will start out with a very clear, strong value proposition, only to have it gradually become diluted as the company matures. New products or services are often developed based on cash needs, new major partnerships, or at the request of large customers. As companies expand, value propositions become a murky affair. We have all been to conferences in which CEOs have stood up to explain their businesses, taking five minutes or longer for what should be a fairly basic, straightforward task. The simple ideas are the easiest to execute. Google’s idea was to “be the best search engine.” They succeeded because, even though there was competition, they did create the most useful search engine. It produced the most relevant results and was clear from clutter and ads. When Google said they were the best search engine, that statement in itself was no guarantee that they had a strong value proposition. Every other search engine was saying the same thing. The difference is that Google IS the best search engine. Keeping these guidelines in mind will help you create a Unique Value Proposition for a new business or “discover” one for an existing business. And remember, if your UVP can’t fit on the back of a napkin, you probably haven’t found it yet.